Five years ago, I was in peril. I had just had major trauma to my body and my spirit. I had lost a huge battle with fertility and it left me sick, overweight and the saddest I have ever been in my life. I wish I could say the next part was, “Then I pulled myself up by my bootstraps and got over it”, but that’s not what happened at all. I searched for answers, why did this happen to me, why were my hormones so disrupted? Why did I feel so sad and anxious all the time? After trying many traditional approaches and failing, I decided to investigate alternative medicine. What I found was nothing short of unbelievable. My chronic migraines were healed with acupuncture. And my scary hormone levels and auto immune issues were completely managed without medicine by eating cleaner. I healed my mind and spirit through therapy and yoga and was able to pretty much eliminate all medicine for pain, insomnia and anxiety through aromatherapy. Hmmm maybe there is something to this clean-living stuff. I was still a full-time makeup artist and once I became aware of what was in some of the products in my kit and the effects on the body, I knew I could no longer subject my clients to any harmful toxins. I didn’t want you guys going through what I did. 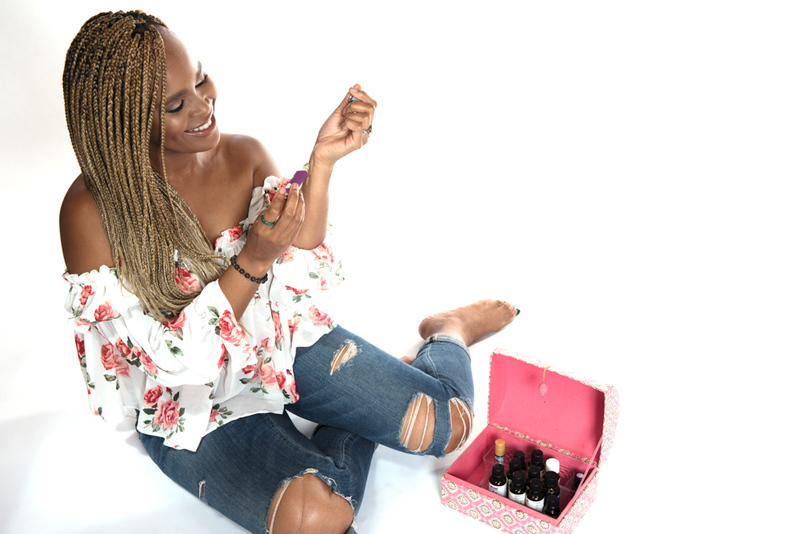 So, I decided to study holistic aromatherapy and clean up my kit to give you a complete mind/body experience while you get pretty. Now my life is completely different. 40 lbs. lighter, healthy, and anxiety free. Looking forward to our journey together. Why the name Modern Green Goddess? Because you can still be a cool girl, love modern lifestyle, not want to live in the woods and weave your own toilet paper and STILL live a healthy sustainable life. I’m doing it and I can show you how to.